This project will teach you how to decorate an apron using lace, fabric, your machine decorative stitches and applique techniques. 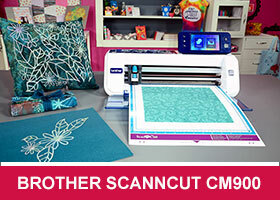 To create this project you can use any style sewing machine. 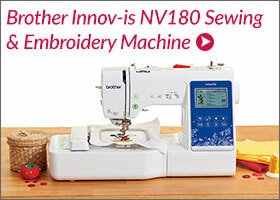 I have used a Brother NV110 sewing machine. You can sew your own basic apron using the pattern from our May Charity Sewalong. I have purchased this apron from a Daiso Japanese store for only $2.80. You may also be able to find aprons like this from $2 stores across Australia. Lace style 1 – 2 x width (plus 2 inches) of the bottom of your apron and 1 x the top width (plus 2 inches). First you need to get together all of your fabric, lace and applique pieces. Start cutting out your applique shapes from the fat quarters. You can choose any colours for these applique shapes but I would suggest you choose a white fabric for the circle and then style your cupcake shapes differently. Lace is the only medium that unites ornament and construction. It has taken a very strong stand on the on the world’s cat walks over the years and continues to adapt taking various approaches in upcoming seasonal trends. Designers are not only interested in starched cotton and intricate application; they are tending to “mix it up” by applying it to different types of fabrics including modern man-made blends, sheers, knits and much more. 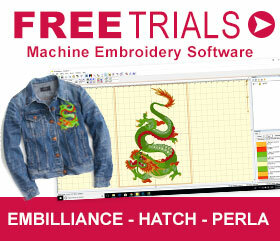 We welcome back John Deer, one of the world’s leading embroidery experts and founder of Adorable Ideas. Joining John for his first big Echidna Event is Martyn Smith, one of Australia’s and New Zealand’s leading sewing experts and now also a permanent member of the Echidna team. Together they will deliver a world first embroidery and sewing educational workshop, exclusively for Echidna customers with a focus on one of the most popular current sewing and embroidery trends. It’s definitely the main event to attend this year.